This ain’t your average Italian restaurant. Oh no, they don’t do the typical Italian dishes of lasagna, carbonara, pizza, or even bolognese, but they (very well) recreate dishes from dishes from all over Italy. Whether it’s the fried cichetti from Rome, or fish dishes from Sicily. 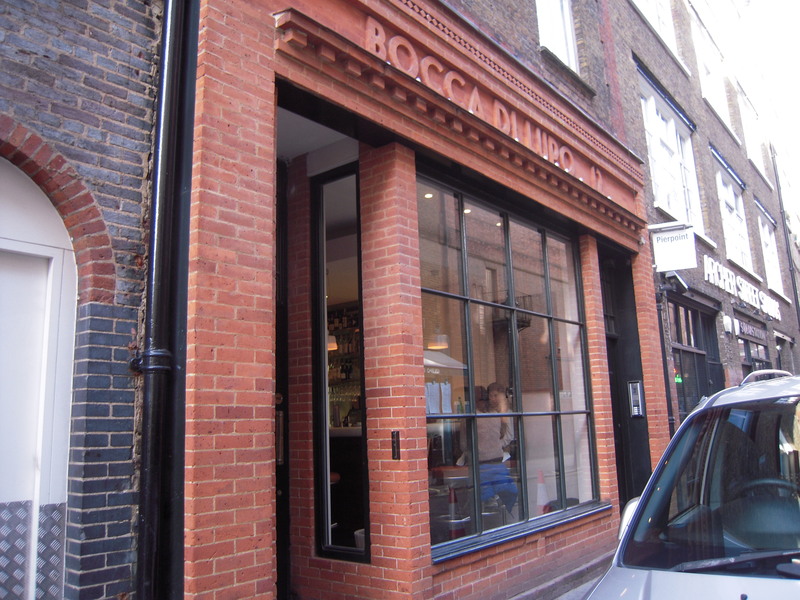 This is one of the best, if not the best, Italian I’ve had in London! I think it’s such a unique concept, but they really pull it off and it was worth everything penny! We first started off with complimentary caramelised onion focaccia, bread and olives . It was served with very good quality olive oil that had a smooth taste – you can tell they care about their produce. We decided to get an array of small dishes, rather than one big dish each, so that we could try as much as our stomachs would let us! Sea bream carpaccio with orange and rosemary (£7) arrived first – a generous serving for what was called ‘small’. The orange zest complimented the fresh fish very well. I would have liked lemon with it, but that’s personal preference, but they forgot to give us some. Saffron risotto, bone marrow and gremolata (£10) was very creamy and rich. We shared a small size for 3 people and that was more than enough, I don’t think I’d be able to finish a portion for myself. But in saying that, it was well executed. Spaghetti with anchovy, wild fennel, saffron, pine nuts and raisins (£8) was definitely my favourite dish of the day. I first tried this pasta dish in Sicily and haven’t ever been able to find it in London. I’m so glad I finally found a restaurant that makes this dish – my only regret was not getting a bigger portion as it was everyone loved it! Grilled wild boar sausage and roast red onions (£9) seemed to be made on site as it didn’t come in a sausage shape, but rather more of a ‘steak hache’ kind of look. The herbs and spices were quite pungent and it was slightly too salty in my opinion, but still good. I have major love for caponata (£7) as I’m in love with any thing tomato and aubergine and love stewed celery. It was packed with caramelised onions. Slightly too sweet for me, but when paired with the bread, ’twas delicious.Puntarelle with anchovy dressing (£7.50). To be honest, I expected very little from this dish as I thought it would be a very standard salad, but I couldn’t be more wrong! It was bitter, but in the best possible way, with salty bites of anchovy and great quality olive oil. It complimented the sweet caponata very well and I’m sure it would be great paired with anything fried or rich. Chocolate and marzipan ball with rum and raisins (£3). I’m not a sweet fan, but my parents tried this and thought it was delicious. It’s only small, but if you want a bite of something to finish your meal, I’m sure this is for you! Sounds like a marvellous place, I ADORE Sicily & spaghetti with anchovies like you’ve mentioned. Wild bore, too. How divine. I’m jealous!